We cannot send any order to press without your approval of the proof. This is for your protection as well as ours. As electronic files are transferred over the internet, they can become corrupted, fonts substituted, images swapped, etc. We don't want you to receive any surprises when you receive your final printed product, so please take the time to thoroughly inspect the proof before you give your approval. Please, don't hesitate to contact us with any questions! You should receive your online proof within one business day after we receive your electronic files. Hard copy mock-ups and hard copy proofs will be overnighted via Next Day Air generally the same day we post your online proof. When your online proof is ready, we will email you a link to the proofing page. We will also try to reach you by phone. In addition to the email link, proofs can be accessed through the myPFL. Proof PDF: A low-resolution version of your file at final trim size, down-sampled for shorter download times. Includes fold line indicators when appropriate. Recommended for slower connections. Press-Ready PDF: This is the full-resolution file which will be used to create your plates. Includes .125" bleed margins, order number and printer's marks which will not appear in the finished trimmed piece. vector text is a known weakness of Adobe Acrobat. how it will print. If it still appears jagged when zoomed in, contact us. Send us a corrected file by using the button. Extensive corrections and/or design work may be subject to additional fees. Of course, there is never a charge for any corrections needed as a result of any errors we introduced in preparing your proof. 2. 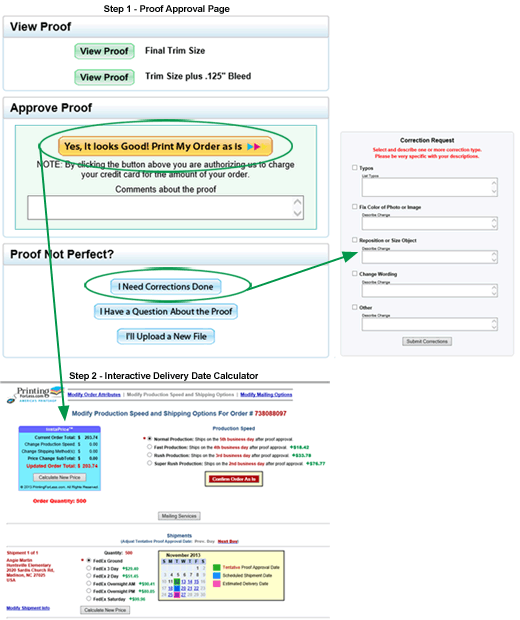 If you are ready to send your order to press for printing, click the button to approve your proof. 3. Complete the approval process by confirming or adjusting your production speed, shipping method and delivery addresses on the interactive delivery date calendar. Experiment with various combinations of production speeds and shipping methods. Split your shipment if you need only a portion of your order faster. It is often more cost-effective to upgrade shipping rather than production. Follow the steps to add additional addresses or modify existing addresses, and be sure to click . It's easy to make changes to your order attributes-quantity, paper type, ink, coating and folding. Click on the "Change Your Order" link, found in either the upper left or right corner of your screen. You can also go directly to the Change Order Request page. Enter your 9-digit order number in the left-hand column. Your original choices for order attributes are marked with a red asterisk. The InstaPrice® calculator will display the adjusted order total for any changes selected. or email an updated receipt. 4. Click on "Modify Production Speed and Shipping Options"
Look for the box (circled below) in the upper left or right corner of your screen, or go directly to the Order Status page. The production status of your order will be displayed, as well as the estimated shipping date if you have already approved your proof. If you are able to make changes to your order-quantity, paper, production speed, shipping speed, address changes, split shipments, etc-the appropriate links will be displayed. When your order ships, you will receive the tracking number(s) via email. The tracking information will be displayed on the online status screen as well. If you have requested that your order ships via an alternative carrier (USPS or truck freight), tracking information may not be available online. Please call 800-­930-2423 with questions.